Is Lync ready for business? It’s a big topic at the moment in the Unified Communications environment. The truth is that there are many collaboration tools out there, but few offer the complete package perfectly. Lync isn’t 100% there yet, but the developments in instant messaging, presence, and screen sharing during video conferences are clever and likely to attract attention. The problems arise with Lync when integrating voice capabilities – the absolute business critical communication method! A recent blog post from “Search Unified Communications” delves into the implications on this topic in a bit more detail and makes for an interesting read, find it here. In the document, Gina Narcisi asks if Lync (and Microsoft) is “ready for business-critical communications”, and immediately points out that Microsoft leaves out several important collaboration elements – phones, video endpoints, and voice and video gateways. However, this hasn’t stopped an increase in deployments of Lync, and this is due to the nature of way people wish to work with UC. But it doesn’t deliver everything, not yet.. but you can maximise it – and that’s what we do. You can keep your existing telephony infrastructure that your staff know, and get the best of both worlds. We have developed some clever integration to enable Lync for carrier class voice, either as a Remote Call Control device, or as a softphone with our SIP Gateway technology. Keep your own telephony infrastructure as well as deploying Lync and give yourself (and employees of course) a soft-phone and deskphone combination giving greater flexibility. 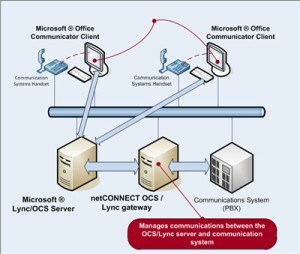 Also enable click-to-dial facilities from Lync and get a true representation of presence as availability is also dictated by phone status and not just the use of the computer. These are all valuable assets to the Lync proposition and to business process and can potentially save countless man hours. Do you currently operate Lync within your environment? Do you use all of its capabilities or simply for an IM/Presence solution? Have you considered integrating voice? Check out our Lync Integration Solutions and let us know what you think about the future of Lync.